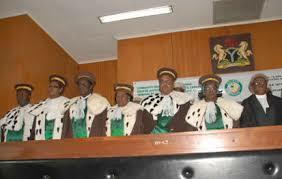 The Community Court Of Justice, ECOWAS (Economic Community Of West African States) is a regional body charged with the responsibility of resolving cases of alleged human rights violations. The court has jurisdiction to address cases involving an alleged failure by a Member State to comply with Community law; which followed the adoption of protocol A/SP1/12/01 on Democracy and Good Governance. Nnamdi Kanu, the leader of the Indigenous People Of Biafra, IPOB, and his defence team have dragged the Nigerian government to the ECOWAS Community Court Of Justice on the grounds of gross abuse of human rights and judicial process. Recall that admist Nnamdi Kanu's continued and illegal detention, the judges that have previously presided over this case had granted him (Nnamdi Kanu) bail on 19th October 2015 and ordered for his unconditional release on 17th December 2015 at the Magistrate Court and the Federal High Court respectively. Owing to these, the Community Court Of Justice, ECOWAS, will sit to hear Kanu's case and give her verdict. ECOWAS court is set to uphold justice and enthrone the rule of law to sustain public confidence with court rulings which has been rendered witless by the Nigerian government. According to Article 15(4) of the ECOWAS Treaty, judgement of the Court is binding on all Member States. More to this, Article 19(2) of the 1991 protocol provides that the decisions of the Court shall be final and immediately enforceable. Non-compliance with the judgment of the Court can be sanctioned under Article 24 of the Supplementary Protocol of the ECOWAS Treaty. The judgment of the Court must be fully and effectively implemented. Owing to the intolerance to violation of human rights by Ecowas court, information reaching Biafra writers has it that Buhari is in panic and struggling to find a way from preventing justice from being served. Today, the 5th October 2016, the world's attention will be drawn to the ECOWAS Court, the Court of Justice is ready to maximise these powers vested upon her to ensure peaceful co-existence of people's in this Western coast of Africa. Biafrans around the world are hopeful that the Community Court of Justice, Ecowas, will redeem the already damaged image of the judiciary system in Nigeria. Nnamdi Kanu will get justice and Buhari's manipulation of Nigeria's domestic judiciary will be crushed.